On July 2, Burger Heights held a friend and family pre-grand opening event. Burgers and fries were served, fountain drinks flowed (they carry Boylan by the bottle! ), wine was passed around (not on the regular menu), all capped off with ice cream and milkshakes (gelato shakes to be exact) for dessert. Between mouthfuls of unbelievably juicy beef, Led Black of Uptown Collective and I agreed that Burger Heights is a great addition to the neighborhood. New businesses do open in Washington Heights but they tend to be the same, he shared. Personally, I love burgers. Love. However, I do not eat McDonalds beef. The interior of Burger King franchises skeeve me out. That left Twin Donut (not ideal), Pick N Eat ($10 burgers) or diners over 20 blocks away. The Burger Heights menu includes high-quality choices but not at a high-end prices. Burgers range from $3.95 - $6.50. The 100% Certified Angus burgers are delivered daily by Pat LaFrieda Meat Purveyors and pay homage to the neighborhood (Heights Burger, The Wadsworth, The Amsterdam). 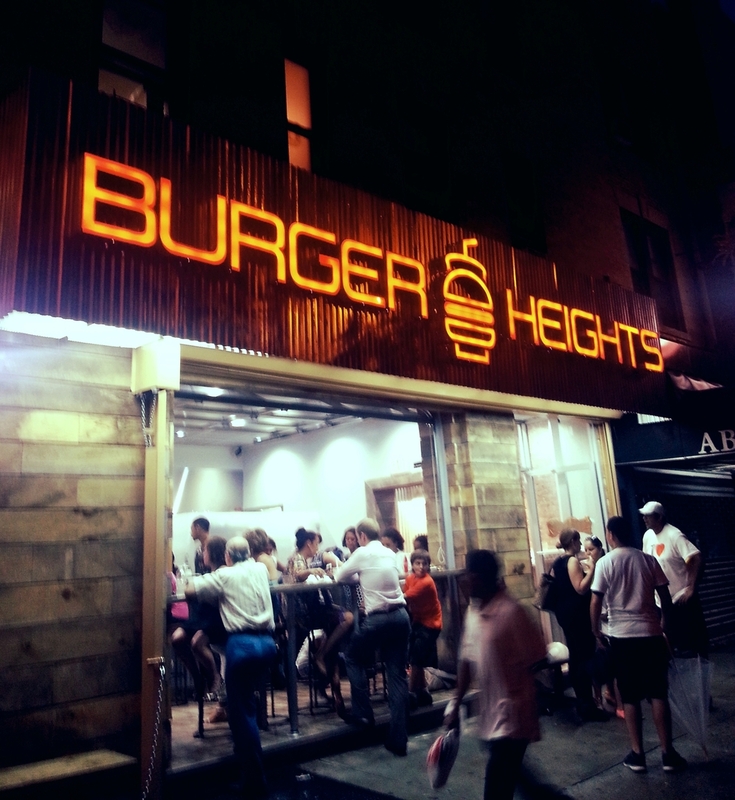 Burger Heights opens officially on Thursday, July 3. Hours are 11 am - 11 pm. According to owner, Ramon Pallone (former owner of Cantinella on Avenue A), delivery services to the immediate area (Wadsworth Avenue) should begin in the fall with plans to expand after that. If last night's event is any indication, I'm sure there will be a demand. Burger Heights has all the elements to be a great neighborhood burger joint.